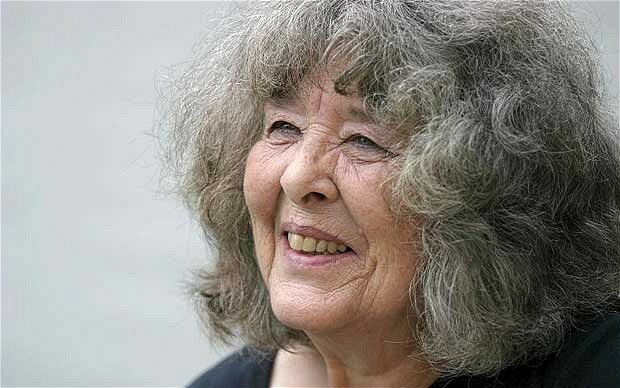 This Saturday we had to say goodbye to a wonderful author, Diana Wynne Jones, who died on March 26 at age 76, leaving behind many, many wonderful books. Jones began writing fantasy books for children and teens in the 70s, and is known for her rich imagination, sense of humor and ability to write complex, engaging characters. Some of the most well known of her 40 or so books include Howl's Moving Castle and The Chrestomanci series. 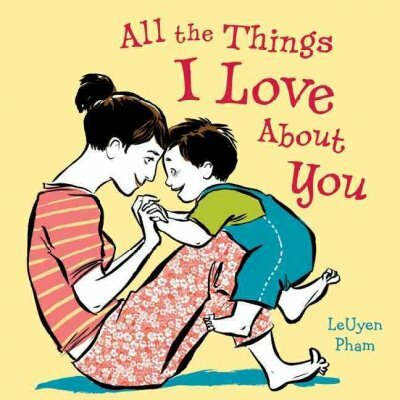 "[Diana] was passionate about what children want and deserve from their literature. Adults would approach her at signings, wanting to know why she wrote such difficultbooks. In one case, when a woman protested, the woman’s young son spoke up and assured Diana, “Don’t worry. I understood it.” She believed in the flexiblility of her readers’ minds, their willingness to puzzle things out, and to wait for clues to anything they couldn’t yet puzzle." I didn't discover her work until I was an adult, but I have loved what I have read, and I look forward to the pleasure of reading more. Thank you, Diana, for your beautiful legacy! The 39 Clues haven't ended yet! For those 39 Clues fans out there, we will be having a program to welcome the newest book in the series. Vespers Rising is actually sort of a transition book between the first and second series in which we will get to meet the Cahills' rivals, the Vespers. In celebration, the Library will offer activities, snacks, and contests with prizes on Monday, April 4 from 4:00 to 6:00 in the Community Room for Grades 2 to 8. But kids can start enjoying the build-up to the new book now with the 39 Clues Scavenger Hunt. Pick up and turn in Scavenger Hunt sheets between now and April 9 to be entered in a drawing to win the 39 Clues board game and all of the card packs. Those entered in the drawing must successfully solve the scavenger hunt. 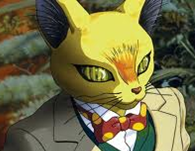 Parents, bring your kiddos to the library on Thursday, March 24 for All Ages Anime from 4-6 in the Community Room. We'll be screening the film Whisper of the Heart, and we've planned activities for kids of all ages, including Wii gaming and Japanese-themed crafts. Join us to sample some of the flavors of Japan and celebrate the amazing imagination of our friends in the East. Join Andy Bryant, hydrologist from the National Weather Services, for an encore presentation. If you thought his flood model was cool, wait until you see his tornado machine! Join us in this Saturday's Weekend Adventure from 1:30 to 2:30 in the Puett Room. Until the last two books I have read, I realized I don't think I had ever read any fiction books on World War I. Now it just happened that I read two in a row. One adult book and one children's book. It was interesting to read about this difficult subject with two different audiences in mind. I highly recommend both books. If you haven't read Ken Follett's historical fiction for adults, you should. It is quite an undertaking to read one of them, but it's worth it. His latest novel about WWI is called Fall of Giants. 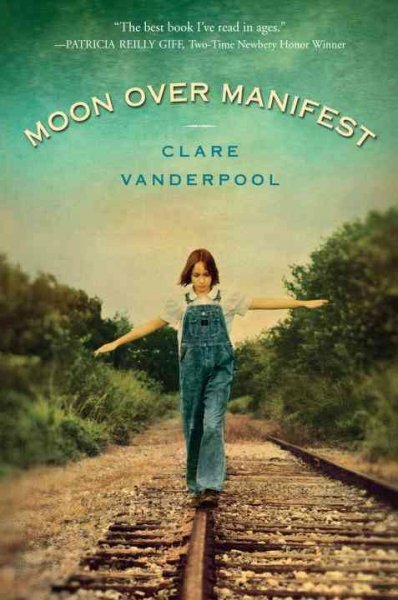 I usually try to read the Newbery Award winners, and this year it was Moon Over Manifest, by Clare Vanderpool. Sometimes I read the Newbery books, and I don't actually think they're that great. This one I read and I absolutely loved. You should try reading the adult book, have your child read the kids' book, and then compare notes. It might bring up some interesting discussion about an important time in history. Photos from the February 27 LEGO Construction Zone session have been added to our slideshow - scroll down and look to the right to check out the cool creations! Be sure to join us on March 27 and the fourth Sunday of each month for drop-in LEGO fun, 1:30-3 p.m. in the Puett Room. 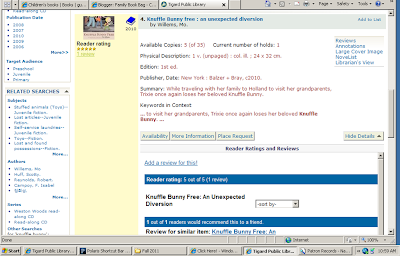 Kid lit site for kids! Here's a rare and wonderful thing: A children's literature website that's actually for kids and by kids! The site features interviews with kids and authors, quizzes like "Are You a Harry Potter Expert?" and kid-contributed reviews. You child can sign up to created content and become an insider in the world of kid lit! If you or your child enjoy sharing your reviews of books, you can also do so through our library catalog. 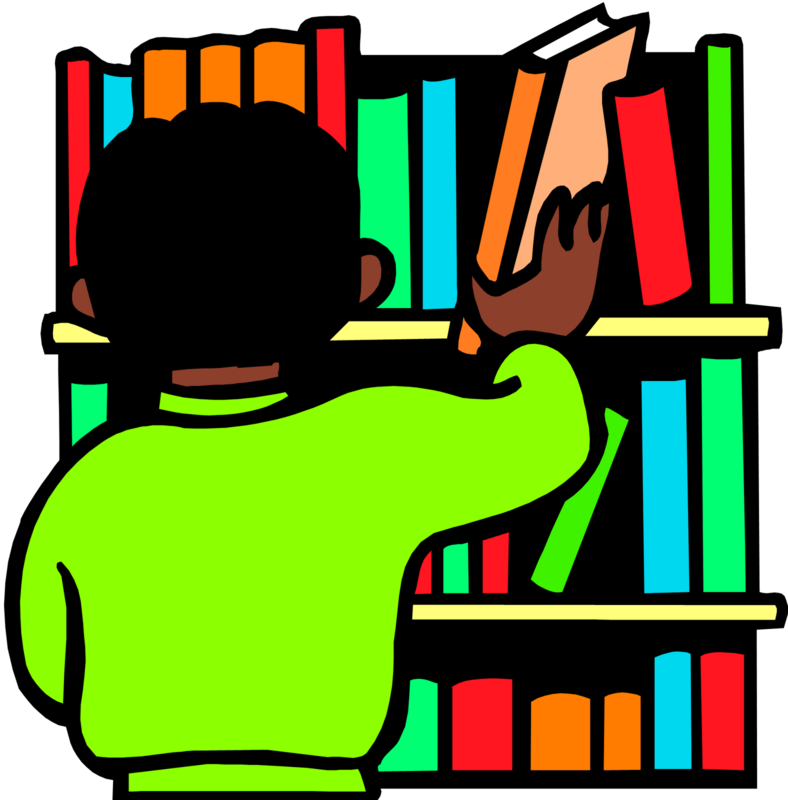 Just log in to your patron account from our library catalog, search for the book you'd like to review, click on "Write a Review" or the review link on the left hand side, and then click on "Add a review for this." 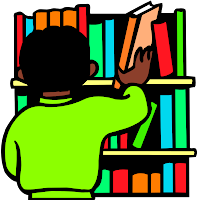 The Dewey Decimal System is the way our library and many libraries, including all in the Washington County system, categorize non-fiction books. Pretty much any subject you can think of probably has its own Dewey Decimal Number. If you find the call number of a book you want, chances are if you go out to the stacks, you will find more like it with the exact same call number or right around there. If the books you find in the the kids' section are too easy, you can even go upstairs, and using the same call number, find something that is a little harder. Our fiction books, on the other hand, are generally shelved in alphabetical order according to the last name of the author.